Stephen Tobolowsky is one of those instantly recognizable character actors that is hard to place in any specific role, though Ned “Bing” Ryerson from Groundhog Day might be his most iconic. Usually he’s playing a stuffy principal, businessman, lawyer, or doctor, and never has he come across as the guy you’d ask to explain the intricacies of pop or rap megahits. But that’s exactly what Tobolowsky does in a new clip from Cut Video. 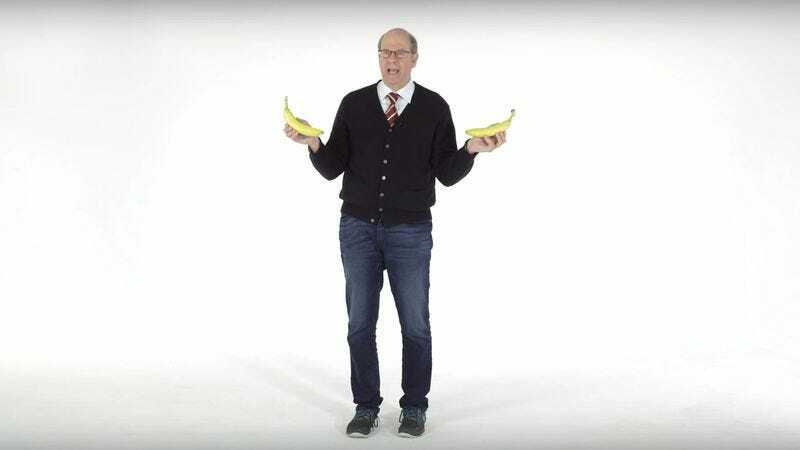 Over the course of four minutes, Tobolowsky dissects Nicki Minaj’s ubiquitous music video for “Anaconda,” which he admits to being previously unfamiliar. Though the set up plays off the fact that he is a nerdy, older white guy, the truth is that he has a few rather insightful tidbits to share. Maybe most notable is his in-depth look into the symbolic nature of the two bananas featured rotating around the turntable, with Tobolowsky theorizing that they represent the song’s two principle love interests, “Boy Toy” Troy and “Motorcycle” Michael. It’s more thought than many of us have ever given the video that is mostly about butts, but ultimately a worthwhile rabbit hole to trek down.